We believe it’s time to make a change. Not only do we want to change the way we eat – we’ll change what we are eating! 100% plant-based alternatives to diary and meat. Oat is great for so many things. This plant-based drink has a mild and delicious taste. It is perfect for your coffee or an ice cold smoothie – you can pretty much use it for all the things you are using your regular diary. Bonus: This products produces 4-5 times less C02 than regular milk! These numbers are from “the field” to the final product including packaging. Numbers are from Carbon Cloud. Enjoy a lovely and mild almond drink where the sweet taste comes from organic almonds from Sicily. Use it for all the places where you are used to add some milk and save the environment for 4-5 times C02! It has added calcium from algae – just shake it well before use, and you are good to go. This is a 1:1 alternative to chicken. 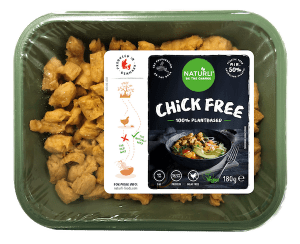 The product is based on peas and the pieces are great for the favorite family dishes when you want to have some meat free days. Use it in your salad, burrito or chicken curry. The possibilities are endless. Your bonus information for this product: The package is made from minimum 50% reused plastic. 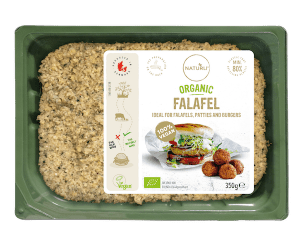 Our fresh falafel is ready to use right from the package and is made from chick peas, lemon, psyllium husks, rapeseed oil and warm spices. Perfect for tasty falafels and greasy burgers and sandwiches. This package is also made from 50% reused plastic! 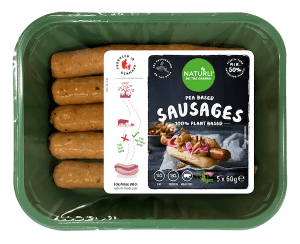 This will be our newest product in our range, and we are super excited to introduce the pea based sausage. Great for gathering your best buds for a BBQ party where you want to serve your guests a tasty hotdog along with some cold drinks. We are for sure going to do that ourselves. The product will contain 18 % protein and 14 % fat. This package will also be made from 50% reused plastic. 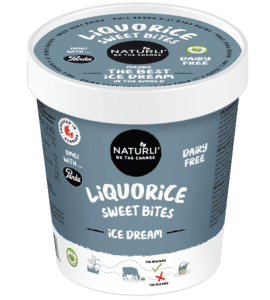 A soft and delicious oat based ice dream with and intense taste of dark and yummi vegan licorice. The licorice ice dream keeps another delicious little secret. There has been added generous pieces of soft, vegan licorice from the Finish brand Panda. It is of course 100 % plant based, is soft and creamy and can be scooped directly from the freezer. Soft and fruity oat based raspberry ice dream with an extraordinary high content of raspberry – it is 19%. The ice dream is mixed with vegan, dark chocolate pieces from Callebaut. It is 100 % plant based, and soft and creamy. You scoop it directly from the freezer. Tasty and creamy oat based ice dream with a deep, rich flavour of Italian hazlenuts mixed with chopped, caramelized, crunchy hazelnuts. It is 100% plant based, soft and creamy – and yes, it can be scooped directly from the freezer. Tasty and cream cacao ice dream with a 100% natural, aromatic orangeoil which gives your tastebuds a well-balanced fresh and sourness to round off the deep cocoa flavour. The ice dream has been mixed with crispy, caramelized hazlenut crunch made from roasted hazlenuts from Italy. It is 100% plant based, soft and creamy, and can be scooped directly from the freezer.